Sarasota, Florida- If you’re interested in premier 55+ communities in Sarasota, Florida look no further than Camelot Lakes. This gated, active community is the perfect place to call home either year round or seasonally. If you haven’t been to Camelot Lakes recently, then you haven’t been to Camelot Lakes. 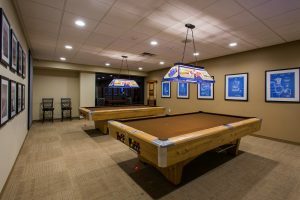 On March 12 the community unveiled a state-of-the-art clubhouse remodel you won’t want to miss. When you walk inside the clubhouse at Camelot Lakes, stop for a moment to admire the beauty. Less than a year ago, this hub of community activity was a much different space. Remodeling the clubhouse meant more than simply planning a building, it meant planning an experience. The enlarged lobby is the main entrance for residents and guests. With high ceilings and large glass windows overlooking the sparkling pond, it’s a welcoming and inviting space. 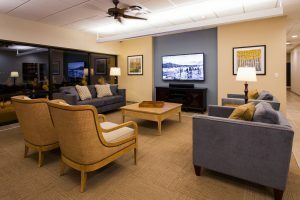 Every inch of the clubhouse was redesigned with the residents in mind. As a community that prides itself on customer service, the office staff is positioned near the lobby entrance so friendly faces can greet each new person who walks through the doors. All new paint, flooring and artwork gave this old building a breath of new life. But those improvements are only the beginning. The lobby features a kiosk that serves as a digital information center. Visitors and residents can view homes for sale or rent in the community, events, reviews of local vendors and more. This technology places Camelot Lakes on the cutting edge of the 21st century. The lobby opens up into a spacious and bright meeting room with glass windows that overlook the beautiful pool. It’s a place where residents can relax and enjoy the company of friends. With a 70 inch TV, lazy boy chairs and plenty of seating, it’s a space that’s as fun as it is appealing. 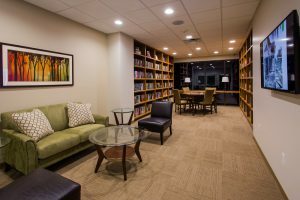 Nearby, the library is home to a comfy couch, large TV and plenty of books for residents to enjoy. The billiards room is ready for a rousing game with two dart boards, freshly carpeted billiards tables, a TV, new décor and new billiards light. The crafts room was renovated with more space and a TV for instructional videos. The second craft room was expanded to fit 2 kilns and new counters and fixtures were installed. Better insulation and an exhaust fan turned this room into the perfect place to let your creative juices flow. Behind the lobby you’ll be drawn in by the smell of freshly brewed coffee. Residents looking for a caffeine fix can stop by the renovated kitchen, which will feature free coffee during business hours. The burnt orange cabinets of the past have been replaced and the kitchen is home to all new appliances. The open family room style gathering area is your destination for post-coffee relaxation. The large space is home to card tables that are abuzz each week with games. A dance floor and stage set the atmosphere for fun events and great memories. This is how neighbors at Camelot Lakes become friends. The nearby business center is the perfect place for residents to catch up on emails, print documents or just surf the internet. For residents who would rather not be tied down, there is free WiFi throughout the clubhouse, so you can cozy up with your coffee and tablet anywhere in the building. 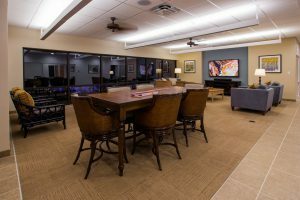 A new conference room near the sales office will help guests learn all about Camelot Lakes. A TV inside the room will give guests front row seats to everything the community has to offer. This active 55+ community is home to two pools, lighted shuffleboard, pickleball, basketball and tennis courts, horseshoe courts, bocce ball courts, corn hole, and plenty of activities. 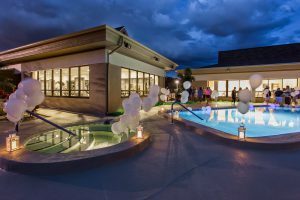 As you walk outside the clubhouse you’ll find the large pool and hot tub and the newly renovated fitness center. It was enlarged by nearly 2/3 and opened up for a great view of the pool and lake. 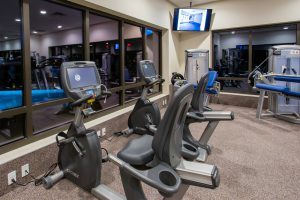 All new equipment and televisions make this the ideal location for sticking to your new year’s resolutions. The men’s and women’s bathrooms at the fitness center are brand new and will feature relaxing wood saunas for residents to relieve some stress. 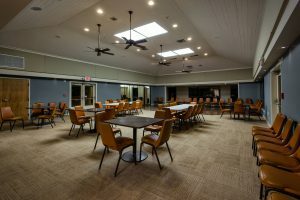 Besides all the exciting new features of the clubhouse and fitness center, it has been brought up to code per the Americans with Disabilities Act, and now includes ramps and ADA accessible bathrooms. Plus, the entire building has an updated fire and security monitoring systems to help make residents and guests feel safe. T his expansion is one you have to see for yourself. Whether you’re a long time resident of Camelot Lakes or looking for a place to call home, this community offers luxurious living at its finest. Stop by this active, 55+ community to see how you can enjoy the lifestyle you’ve always wanted.